Trash is an unsavory, yet inevitable, byproduct of life. Therefore, any property where people live or work—including office buildings, schools, apartment complexes, and residential homes—must have exterior trash receptacles in which to store the building’s accumulated refuse until it is picked up by the garbage truck. Unfortunately, dumpsters and other trash receptacles tend to be eyesores that can compromise a property’s aesthetic appeal while attracting unwanted attention from wildlife. Well-designed trash enclosures are the key to minimizing the negative attributes of these receptacles, while allowing easy access for trash pick-up and deposits. Trash enclosures help promote safety and security by keeping animals, and even curious children, at bay. This is particularly important for properties located near open desert or other natural spaces, as coyotes, javelina, and similar critters may view your trash as their treasure. Their presence may pose a safety hazard for anyone who encounters them—and at the very least, their foraging in the trash will leave behind a nasty mess. Additionally, children may be tempted to play in or around trash receptacles, which is a clearly risky activity that could create liability for the property owner. By concealing the dumpsters or garbage cans, trash enclosures keep the temptation out of sight from animals and kids. 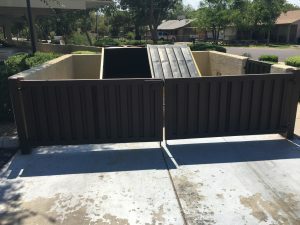 In addition to reducing the risk of safety hazards, trash enclosures can improve a property’s appearance by hiding unsightly trash receptacles. Using a variety of materials, trash enclosures may be customized to suit the style of the surrounding property. 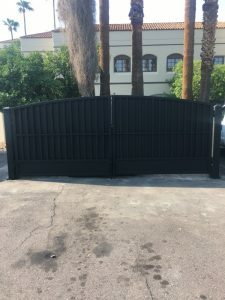 For example, at DCS Industries, we frequently create trash enclosures using gates and other barriers composed of an attractive blend of wrought iron and wood or composite wood. We use only the highest-grade materials, creating finished products guaranteed to withstand years of wear and tear. Upon installation, our team of experts ensures that all components are functioning properly and the trash enclosure flows with the property’s style. Call us today at 623-825-7700 for a free estimate on a custom trash enclosure for your residential or commercial property!